All these were sold, even though everyone except the Violet ring got a Use: or Equip:, and those should be ignored according to your description? Hey catonbreak. I'm sorry to hear that. I just tried it with the Cloak of Coordination and it didn't get sold... was this a one time thing or did they keep getting sold? Also, could you reproduce it after restarting WoW, or without any other addons loaded? Thank you for your reply! It kept happening, but when I disabled all addons but this, it only sold the Voilet Ring, which makes sense, because it has no Use / Equip. Very interesting. So it seems another addon conflicts with this one, but I get no errors. Edit: Now when I again enabled all addons, it only sold the Violet Ring. So apparently it's working now, for some reason. Edit 2: It happened again, so I added all to the notjunk-list, and now it's working, but what's conflicting, I don't know. Very strange. Do you have any addons which modify item tooltips perhaps? AutoVendor looks for specific words in the tooltip ('Equip:' and 'Use:' in the English version), if those aren't present, then the item is considered a "regular" item. I have TipTac, but other items work. I am currently farming old content, and every item with Equip, Use, are ignored, like it should be. "Consider adding a feature that automatically replenishes your items?" I just installed Auto Vendor and liked this addon the best. Had been using SellJunk for a long time but love the features of AutoVendor. I test drove another addon that is lacking but had a great feature to replenish supplies, which is HUGELY useful for my crafting. Hey N3wB. Interesting, apparently there are items without a quality, which broke when I updated the check for legendaries. Version 61 should have fixed this, sorry for the inconvenience! Hey NP glad you were able to see the prob and get a quick fix to it, TYSM for your contribution to the WoW community!! Any chance we could see a way to handle mass sales a little different? I do a lot of WQ's and easily fill my bags w/ greys I could care less about selling. Maybe an override for the 12 items sold or a button on the vendor window to do the next 12 so you don't have to close and re-open it? One more request, maybe a fallback to player funds if no guild funds are avail for repair? Again ty for all you do, if these requests require too much don't worry about it, just minor QoL things. Also I'm almost 100% sure it was "Soggy Treasure Map" that was causing the error. I enabled the sell low level soulbound items and it's trying to sell my Underlight Angler. Maybe it should exclude artifact items from this by default? Hey Smartie, thanks for the report. Good idea, wish I had thought of that before ;) I updated the mod to version 60, which will now never sell artifact or heirloom (another omission) items. There is no libs folder included in the most recent version at all. This problem should be fixed with the latest version. Sorry for the inconvenience. For some strange reason AutoVendor tries to sell the epic level 180 Darkmoon death metal helmet (ID 151252) when I set the sell ilevel to anything higher than 136. Does not seem to happen with other high level gear. Keep getting this error and have no idea what is causing it. Have any ideas how I can fix this? Hey I really like your addon, there is only one option i would like to have. Can you add an option to not only sell 12 items per shop opening? 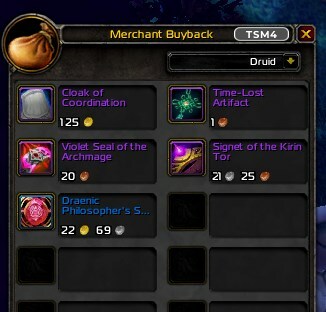 Can you add a /destroylist that's left blank for us to opt items into that way when we visit vendors to sell stuff, things like [Wrapped Gift] id=13367 or the AQ40 mounts we don't want get deleted?